A major celebration of Ireland’s ocean wealth will take place this summer in the real capital of Ireland, Cork, the rebel city. A two day event, 10th and 11th of July, is planned for Ringaskiddy and Haulbowline in association with The Marine Institute, IMERC , the Beaufort Building, the National Maritime College of Ireland, NMCI Services and the Irish Naval Service. 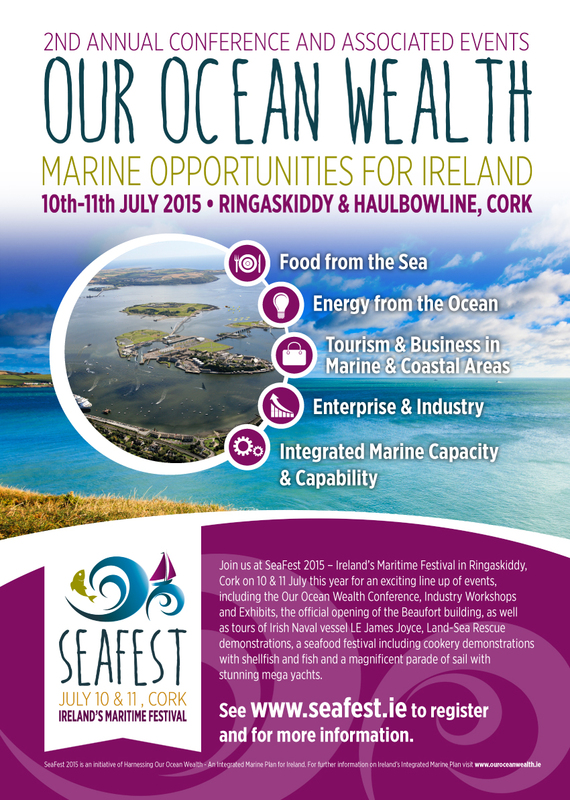 The event is an initiative of Ireland’s Integrated Marine Plan – Harnessing Our Ocean Wealth. It will build on the first annual “Our Ocean Wealth Conference” which took place in Dublin Castle last July. The event was attended by over 500 delegates. This year the organisers hope to attract a wider audience over the two day event which will include a conference, marine technology expo, investor events, workshops, a seafood festival, family fun, and competitions. By broadening its scope to include a range of activities open to families as well as businesses and potential investors, the event aims to highlight the social, cultural and economic benefits of Ireland’s marine sector and provide a platform for public engagement with Ireland’s marine resource. With trade fairs, an Oceanic Experience, Mega Yachts and tours of Haulbowline, NMCI & the Beaufort building it’s definitely a date for the diary. So, why not save the dates? July 10th and 11th 2015…. It’s your chance to visit us here at NMCI Services and gain an insight into the maritime sector. For further information regarding this spectacular event keep an eye out on the NMCI Services blog over here where we will keep you updated on developments or why not check out the official conference website here.